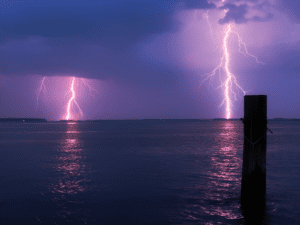 Home Boating Safety	SAFETY FLASH: What to do when Lightning Strikes and You’re Out Boating? Fair warning: Lightning and boating do not mix! Love boating so much that it is not unusual for me to go out on windy and rainy days. I figure that even if the weather isn’t perfect, it’s better to be out on a boat than on dry land. Rain is one thing. Lightning is something entirely else. It is the difference between an inconvenience and a dangerous threat. Have you ever been out on the water when a storm brews out of nowhere? It’s uncomfortable to be caught in a sea of pelting showers, but add some cracks of thunder and bolts of lightning and we have a serious situation. You might think you’re a safe distance from a storm, but don’t be fooled. Boating Magazine says that if you count the seconds between the lightning flash and the thunderclap and divide by five, you will have a rough estimate of the distance in miles you are from the lightning strike. 2). The summer months are prime time for lightning activity. More than 70 percent of the lightning fatalities occur in the months of June, July and August. 3). If your boat is the only one in the vicinity when lightning strikes, Boating Magazine warns “the odds of being struck go way up.” This venerable authority also reports that most strikes occur between noon and 6 p.m.
4). Lightning always seeks the highest spot … and that is the top of your boat. If you are on open water and can’t get to land, Boating Magazine suggests putting on your life jacket and finding a protected area out of the wind to drop anchor. Remove all metal jewelry. Stay away from metal objects, electrical outlets and any appliances. If your boat has a cabin, go inside. If you have fishing rods or outriggers, lower them, stash your fishing rods and disconnect any power leads to electronics or antennas. If you are in an open boat like a bowrider, get as low as possible in the center of the boat. Stay out of the water. 5). A storm generally will dissipate in 20 to 30 minutes, but it is better to be safe than sorry. Rule of thumb is to wait 30 minutes after the last round of thunder before resuming boating activities. So, how do you prepare in advance and what can a safety-conscious boater actually to do when caught in a thunderstorm? Start by making it a practice to check the weather forecast prior to boating. While it may be sunny and clear when you are schedule to leave the dock, that doesn’t guarantee things won’t change in a flash. Check local TV weather and internet sources (and note that the NOAA weather radio also makes special alerts on VHF channels 1-9). There are also APPs that provide early warning for developing storms. Boating Magazine recommends searching “lightning app NOAA.” Always use good judgment is assessing risk. Your advance preparation in choosing safe locations will save precious time. Review your chart prior to departure to pinpoint nearby safe areas where you can find shelter in a storm. When at all possible, dock your boat and take shelter in a building. When it comes to lightning, it is always best to be safe instead of sorry. Please, take this to heart. As much as I love boating I would rather play it safe, skip an outing, and be around to boat another day.